Gateway Of India Short Boat Ride Ticket Fare: Rs 70 is the cost of a short 30 minute boat trip which starts and ends at Gateway Of India (Mumbai). Gateway Of India to Elephanta Caves Ticket Fare: For a “Luxury” boat the cost of a return ticket is Rs 150 for Adults and Rs 100 for Children (age 3 to 7). For an “Economy” boat the cost of a return ticket is Rs 120 for Adults and Rs 85 for children. Elephanta Caves are closed on Monday; so there is NO BOAT SERVICE TO ELEPHANTA CAVES ON MONDAY. Gateway Of India to Alibaug (Mandwa) Ticket Fare: Single (one way) ticket fare for boat trip from either Gateway Of India to Alibaug or Alibag to Gateway Of India is Rs 110 for the Main Deck of the boat/ferry, Rs 135 for the Upper Deck and Rs 150 for the Air-conditioned Section. Price of ticket includes boat ride from Gateway of India to Mandwa Jetty (or vice-versa) and bus ride from Mandwa to Alibaug (or vice-versa). NOTE: During the Monsoon season (June to Early September), there are NO BOAT RIDES from Gateway of India to Elephanta Caves and Alibaug (Mandwa). During the rainy season, only short pleasure boat rides are available from Gateway of India. All Boat/Ferry services stop when it rains. The ticket booking office is at the entrance of the Gateway of India complex. Beautiful views of the Arabian Sea, Gateway of India, Taj Palace Hotel, Mumbai docks and harbor. Gateway of India is an imposing building that is designed in the Indo-Saracenic style (mix of Gothic, Victorian, Hindu and Islamic architecture), which was popular in India during the British Raj in the late 19th and early 20th century. 11 km (7 miles) Ferry Boat Trip from Gateway Of India Jetty to Elephanta Caves (UNESCO World Heritage Site). Short pleasure Ferry boat rides in the Arabian Sea. Get a view of Mumbai port and the numerous ships that dock there. Tourist can take a short boat ride in the Arabian Sea. 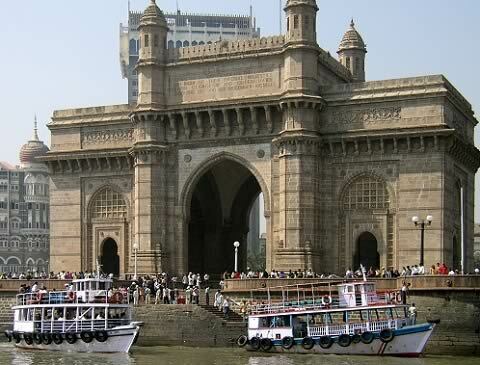 Excellent view from the boat of the Sea, Mumbai docks, Gateway of India and Taj Hotel. Don’t expect the Boats to be leisure cruises. They are rather basic, but safe for the short trip. Boat trips start at 9:00 am, and there are boats at regular intervals. Boats available at the Gateway Of India complex, left of the Gateway of India structure (please see first image above). 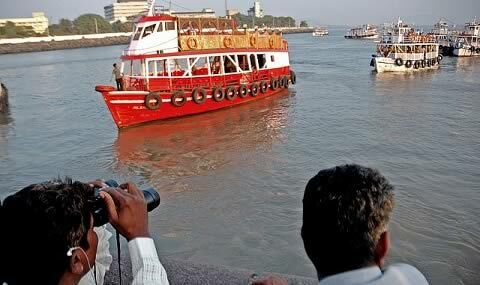 Short boat trip from Gateway Of India costs Rs 70. Tickets can be booked at the office near the entrance of the Gateway Of India complex or near the boat/ferry. Boats are not available when the sea gets choppy, especially during the Monsoon season. 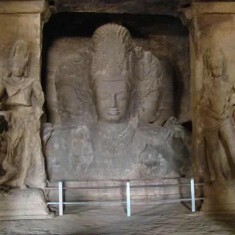 Elephanta Caves are a group of caves with religious carvings on the “Elephanta” Island (also known as “Gharapuri”). There are 5 Hindu caves and 2 Buddhist caves. The highlight is a 20 feet “Trimurti” or three headed Lord Shiva. First boat departs at 9:00 am and there are boats every 30 minutes. 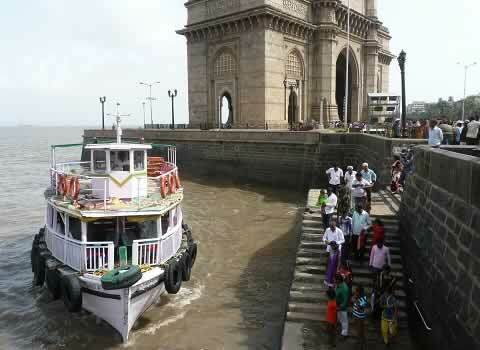 Last boat leaves Gateway of India at 2:30 pm. From Elephanta Caves the first return boat starts at 12:00 noon and the last boat departs at 5:30 pm. The cost of a return trip from Gateway Of India to Elephanta Caves is Rs 150 for Adults and Rs 100 for Children (3 to 7 years). An “Economy” boat/ferry is also available to Elephanta Island, which cost Rs 120 for Adults and Rs 85 for Children. There is an additional premium of Rs 10 per trip for visitors who want to travel on the top deck of the ferry boat. Ticket booking office is near the main road, at the entrance of the Gateway Of India compound. The Ferry passes Butcher Island on the way to Elephanta Island. PLEASE NOTE: Elephanta Caves are closed to visitors on Monday. There is no boat trip from Gateway of India to Elephanta Caves on Monday. Ferry boats are small with a capacity of around 100. These boats roll and toss quite a bit. Visitors who suffer from motion sickness should avoid the boat. Do not take the boat when the water is choppy. Getting on and off the boat can be tricky and scary. Pick up small children. Elderly visitors may want to avoid the boats. Boats have basic safety equipment (lifebuoys, etc); but it is advisable to stay away from the edges. Gateway of India is very crowded on weekends and holidays. Please visit this link for the main tourist attractions in South Mumbai. Apollo Bunder, behind Regal Cinema and Bombay Museum, near Colaba Causeway. VT Station (CST) on the Mumbai Suburban Central Line and Churchgate on the Western Line are the closest Local Suburban train stations. Visitors can take Public BEST Buses which travel to Fort, Regal, Colaba, Churchgate. All these places are close to Gateway of India.